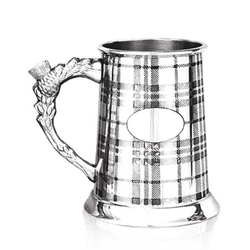 Our Straight Tartan One Pint Pewter Tankard measures 5.11 inches tall by 3.14 inches wide. This tankard is the perfect gift for a proud Scotsman, this one pint pewter tankard has a tartan design which covers the majority of the body, as well as a gorgeous Scottish thistle style handle. There is a small oval on the body which is left plain to allow for the engraving of a name, date or short message to make the gift truly personal as well as fiercely patriotic.